The server is fun but sometimes it lags, overall 4/5. i like to play on this Server! eeww thinks this server has an amazing community, which really makes it swell to play on, I love how the server isnt usually laggy and is playable. so far i love this server, the community is friendly and the staff are fun! I really like playing on the server, I just entered with a new account, since I forgot password on the main account. I finally found the perfect Pixelmon mod server! I really like it.I´m playing on it for a short time but I already like it. Its very fun to play on the server. honestly its very professinal. Really fun to play the server kinda gives you some stuff so you dont have to spend so much time playing normal mc and you can kinda get right into catching pokjemon which is nice. I really like this server. I have only been on it for like 15 minutes and it is already better than most, and the tools that are available to get make everything so much easier. This is a great server i haven't been on pixelmon servers in a good while ut now i feel like i can start to enjoy it all again to play with other players as this server holds a bunch of fun stuff to explore im rather new so i havent seen anything ad about it yet and i dont think i will. My name is Pootstablook and i must say that this server is really great, i love it :) i'd recommend this to players who just started on pixelmon. The server is awesome. The events are fun, it's not laggy, spawn rates are high enough. Players are respectful and the staff is very helpful. It's totally what I was looking for ! I will start off with, as of right now I don't have any dislikes. I love the instant teleport, make it so much quicker. the mmo adds so much to the pokemon server . This is a wonderful server and i look forward to play on it for a while . I like the commands you can use and the pokemon animations. The admins and helpers are also very kind and helpful. very nice server i love it!! The server good, helpers so help and i love so mutch this server and i tell to my friends to play with me in this server! Thank You! community is not toxic as a lot of the servers are. I love the spawn rates of the Pokemon. Also the server runs smoothly, for the most part, which is more than pleasing to me all around having a great experience,10/10 server all round. Very pleased. I really enjoy this server, I like the survival aspect of it and the admins I have met so far have been kind, and the way it's been handled is good as well. But I feel as if they should make the "Back" command open to everyone so it's easier for people to go back and forth places either way, this is my review have a wonderful day/night! So far in the couple of minutes of play time, the server seems to have an easy spawn where its easy to find a location such as the pokecenter. Have to wait until gym leaders get online, however its fine since there are multipl gym leaders in the server. Really like it so far. I like how it's really close to actual pokemon games, but the lag and game breaking glitches are an issue. I LOVE this modpack its got a great and helpful community and it's easy to run. All in all its just wonderful. I like everything it's so good and I've been looking for a server just like this one ! The people were nice and the server space was good. Large areas designated for building and catching. Good server for new players. Very easy and simple to navigate, but you'd have to be dedicated and able to spend time to work your way up! Server is super pay2win contrary to what is listed as a tag with things like a $90 shiny kit $80 tool kit $60 legend packs $25 UB commands like /compsearch to make basically all tournaments and gyms unfair when someone can look in your pc and know everything you own. Areas are locked off to certain ranks only like the end for $25. They also offer people rare candy to people who make fake good reviews. Unless you wanna drain your bank account to get anywhere on here I'd say find a different server. It is really great and fun thank you. Epic Gamer Pixelmon Server Yes. CaptainColton03-The server is great and is a lot of fun for you and your friends, and also great to play alone and meet new people. Definitely one of my favorite Pixelmon servers. great server but i wish there to be an area where you can train your pokemon, RameGames. greate server, good vibes and the staff are really good. I really like that the server has this review thing so people can get free rare candies. i also like that my froakie is really small and i think everyone is. Great server, many helpful people and helpful staff. They are all kind. This server is much better than pokecentral. This server is great and also helps new players on what to do. I told my friend about it and now the 2 of us are playing it nonstop. FUN i love it! would reccamend to all my friends!! well over all its a nice server but i would like to see some changes like a warp random and maybe the apricorn spawning a little a higher and the privilege to be able to sell cobblestone. So far seems REALLY fun! pretty good yo its pretty decent and the people are nice. Great server!! Well designed spawn and fair giveaways! I like this server because the staff is awesome and i love Madsi6 <3 and uhm yes it is a very good organized server I LOVE IT. I really like the server but there is an insufficient amount of pokemon in the wild and I have been playing for two days and I'm having second thoughts about the server. I love this server. Cool, friendly and cute! They have nice players and they have gen 7 so they the only server i play on. Great server, lots of nice players. I like the inclusion of gen 7 in the game. Thank you for a good server. I like the server it is fun and well made I really enjoy playing in it. Good server lots of fun, friendly staff. A perfect way to play two of the best games! everything about this server is so kind. The server itself is nice, beautiful architecture, helpful moderators, and not a laggy mess! With the execution of the other servers also being on one server doesnt have a chat being flooded. Although theres times something may happen that has no clear explimation like what to do with a Hunt Pokemon. Certain commands like /tpahere isnt a thing, which sometimes gets annyoing. But all in all i feel its a fun little server for pixelmon gamers like myself. This server is amazing, I play on it all the time. Got me into pixelmon. Really like this server. Amazing server, but it sometimes has a bug so you have to relog. Very nice server got a lot of people and all of them are very kind! great server for fun multiplayer with friends. love the atmosphere and the staff is great. great people. great events for everyone. not pay to win aswell. really nice server. love the game staff is really nice. environment is good. Nice moderators, fun little events and nice people that help you out when you have a question. All in all a very good server. I actually really enjoy this server, it is my first modded server play and this one is actually really good, there is a lot to do and keeps you entertained! Awesome admins and great community! hi i am _svene7_ and i think it is a great server. . . . . . . . . . . . . . Cool server, people are friendly and staff are helpful. I think the server itself is pretty good- from what I've seen, it has a good community. But, I think Pokémon spawns could be a bit... higher. I understand it's to reduce lag but having to search for up to 10 minutes for any to spawn at all is tiring. And finally, for a whopping 200$ you can tp through walls, tp to where you're looking, and INSTANTLY breed pokemon right in your inventory! and lets not forget everything else previously listed thats also included. Oh, and also double the rewards from voting. Mods aren't too good at getting back to people who need help either and usually very few are on at a time. Great server with friendly and helpful staff! This server is a total blast! 600/600 rating, would play again. Great atmosphere, and nice survival integration with the Pixelmon mod. Oh my gosh this server is so amazing!!! Server is really unique and fun. This server is very nice, they got a nice organization and very helpful plot. I love the open community and that if you have any questions there is always someone there to answer. It's super fun and everyone is super helpful!! This server is very fun. The admins are very nice, and so are the people that play! Most if not all players are caring and will help out newbies to pixelmon. Great server, has lots of things to do, helps players move along with rewards and shop. pretty great server. Lots of fun. This server is so much fun. I play it every day and its a great way to do stuff with friends. I love the server but wish i could use /back. Very good server, good community and amazing events. No lag either. its a pretty fun server with lots of things to do. The one and only problem is that you have to relogin every time you warp for pokemon to spawn. This server is probably the best pixelmon server out there though, by far. Everything I have is a minor complaint or less. I honestly don't have any complaints about this server, the staff are always answering my questions and people are generous on this server. The server is very reliable and the community is very helpful. 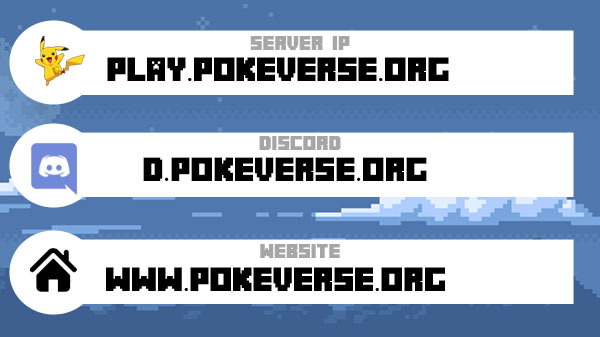 Most other servers I am automatically disconnected due to my faulty internet, yet in play.pokeverse.org I noticed that despite my faulty internet I am able to play. Really great server! Super friendly staff and community! great server! been playing for about 2-3 days. multiple staff have been very helpful explaining the updates to pixelmon i've missed. Really fun server with moderators and community with fun server events. Also really cool how all the pokemon are available to catch. Server is great. People are extremely helpful! Tons of fun, lots of nice and helpful people! This might be the best pixelmon server that ive played on!! This is the best server ever. Gotta catch 'em all! I love this server! Will be hanging out here a lot more! This is a great server. There are always mods or staff online to help, and the community is very friendly. Fun and friendly server, got a couple friends to join as well. Well done. love the server. love the staff and love the players. they all friendly and kind to me. Its a great server. And i am really having a great time as MCIcyChip. The server is well run and with responsive mods. So far I am having alot of fun in this server, it's runs alot better than the one I was in before and is alot more active with a really good staff. I really enjoy the server. Very smooth gameplay with frequent updates. Community is very positive. Just wish there was pvp with like swords. The People are so nice and welcoming. Theres no lag no the server side. Im really enjoying this server at the moment! Upon first visit I can already tell the community is friendly and welcoming, will be playing here more often! User friendly server. I have just began and alreadly feel welcome. Questions amswered immediately and loot balls announced. I liked this server it really gave me the ability to play a classic game-Pokemon. It was a great experience to play with friends and socialize with the people on the server too. I really like the server. There are always helpfull people online and there's aways a lot to do! I'm really happy to play on this server. Its a really good server where you can explore , catch pokemon and fight against your FRIENDS ! Awesome server. It would be better with more players. But it's still great. One thing though is that some of the rewards take to long to get. Pretty good server, nice people, nice mods, try it out. The server is great, I'm currently on it and everyone is so nice! I really really love this server. But sometimess my game crashes out of no where but keep it up! xnarwhals123 Hey this is pretty good. I love this server! The community is so nice! On my first day, I was confused with lots of stuff and embarrassingly lost my house and the entire server was prepared to find it for me (they did). And the server is great at decluttering the map and has a solid connection. I definitely recommend this server. I really like this server, and the community is great! I and my girlfriend are having a great time playing. keep up the great work. Cheers from Denmark! Good server. i look forward to spent some more time. CaptKaizer here, just reviewing for the reward, but I really enjoy this server, and I hope it continues to thrive. I am ConsumerOfSouls and this server is great! I've been with this server for a couple years (albeit sometimes inactive) and it's always been a fun place that keeps me coming back. The staff and gym leaders aas well as most of the other players are all super kind and fun to be with. Keep it up guys! Hi. I don't know what to type because I played a pixelmon server a long time ago, but I don't remember which modpack... but I did notice that there was a solution if you lost your starter which(back then)[whatever server on whatever modpack I used] did not have. I love this server and have been playing for quite a while! I will never quit playing on it. Fun and great every staff is very friendly and hosts events alot. Playing this server with my brother is pretty fun! really like this server, It's super fun. pretty good server, it's a blast to play with friends! I do like this server and recommend the server, but there are some flaws like lag or you can't even find any pixel'mon at all. There are some minigames for some spare time and you can get a key if you win. There are of course gyms and you can fight if a leader joins. It is not a factions server so you can claim blocks. I don't have a good review but I will give it an 8/10. P.S. my user is DarkerJam I needed to edit this to tell my name. Just joined! You get a reward for reviewing which is why there are so many reviews. Leaving an honest review for my first day's experience. Legends spawn randomly and there's an option to check the last three that spawned and when!! Easy to play and helpful people. Nice server! People are helpful and cool. Pretty new to the heavily modded minecraft servers, but this one is by far the best one. The mods are helpful, the server isn't too crowded. Plus, they are lax on the "Cannot build in spawn" 10,000 blocks out. Sadly my only problem with it is the complexity, while super easy to comprehend and research, some may be driven away by the amount of information to take in. Other than that it's an enjoyable experience for me and my friends and I would definitely tell others about this. Its an amazing server, but they could gain popularity by just adding inventory tweaks and treecapitator. Vein miner would also be good but might be little OP. enjoyable server so far... I am halozeus cant wait to get my friend on. I like community, how everyone tryna help each other . But I have sometimes buggs.. maybe it's because I have low PC or if it is because are some server buggs repear it please . Nice server, friendly staff and fun events. Its a fun server with lots to do, fun community everyone is nice and there is little to no lag! nice server, not very laggy and i find it fun. The server is great. There are events every once in a while which are fun. The community is great too! This server is so far amazing. I don't lag and everything about it is so fun. I really love the Pokesnacks that heals your pokemon, its very handy. One thing I dislike is that the spawn rate is quite low, atleast according to my experiences. Name is itssjustvic. Lot's of really useful Commands /rtp and the like, no truly awful restrictions, I feel like I can have plenty of fun without paying, and as such it might entice me to pay. Name is Carinail. The map is big, nice and lively. Love this server! Friendly staff and chat feels very active! Not all ranks you need to buy, like Regular, you get that rank by playing, of course this rank requires gametime, 12 hours to be exact. this server is great, the staff is welcoming and the people are friendly. amazing mod with great people and beautiful pokemon models. Great server, really fun to play on with friends and their is no lag!! Nice Server very fun to play. The Players don't scam and you can trust them. But if you do Alt + f4 a little bit of your items will disapear. SnoschyBtw. Thos server is bnot as good as thanoid but sere darn god at it! DeepGalaxy I think its a good server. it was easy to get and I love it. This server is amazing! I've had a great experience so far, everyone is so friendly and nice. There was one issue but staff resolved it in a quick, timely manner. Just joined the server not too long ago and i am already enjoying it the staff are always active and are responding super quick. This server is great right from the start. Great staff and upkeep plus they make it easy for new people and always help them. Good server, although there have been many rollbacks lately. (IGN - train687) I like this server. There are loads of differnt kinds of pokemon to hunt for, to slowly fill up your pokedex and be at the top! It is very fun. I like how it was just simply good ol' Pixelmon. Quick and easy fun server I could play with my friends. Great server! I'd love to see how the future turns out. the helpers and mods are super helpful, friendly and patient, especially to beginners. not just the staff but everyone seems very friendly. definitely check out this server! Best pixelmon server ever. I have a lot of fun. The staff is very very useful and kind. The community is nice to each other and helps each other out. This is probably one of the best pixelmon servers I have ever played on. ok this time ima put my ign oml this was harder than i wanted it to be. Gud Stuffs Matey, Lovin da Fon Times! Thank you Pokeverse, very cool. This sever is great I have a fun time with my friend! Super Fun! Gonna be playing it quite often, and hope to see other players play it as well! Nice, sweet server. Great community, great casual, good players! Recommend! Just joined! It seems like a really awesome server! My name is Meyadin, and I absolutely recommend this server. In fact, i'm gonna be having 2 friends join me on the server soon so we can have even more fun and possibly even a pixelmon series on youtube. Honestly this seems like a safe a fun server. xxwinter_flamexx great server very fun and is great. The lag is horrible, and there are many command restrictions (no /help? really? And no /back either) and you can only set 1 home, which is annoying. The players are nice, the economy seems to go smoothly, and the events are cool though, which saves it from the worst rating. Overall this is in my opinion the best pixelmon server out there. It is regular pixelmon gameplay but it has many unique features, such as the pokebuilder feature. Everything about this server is very organised and clean. But one thing i miss is the /shop feature. Its pretty good. Mostly same old pixelmon. The game is probably the best minecraft pokemon servers I've played. It has friendly players and great staff. I'm not too sad about this, but I can't seem to find any pokemon at all. Overall a pretty great server with helpful staff. Had a good time playing so far. Great Server,Staff and Community,best server i have ever played on. So far, the server is incredible. The staff is friendly, and the features and availability to items to start off are amazing. This server is amazing The community is great It's really fun and interactive, glad I downloaded it. This server is probably the best server i've played on. The server has zero bugs or any form for lags. this server is very cool. Very kind and welcoming server! Helps everyone they can, even dumb people like me who forget to put their name on the reviews -_- Thank you demonchu you're a life saver! It's a realy nice server to play on. There is nearly no lag on the server. The peaple are nice to everyone. i love it its very good nice comuninty. It is a great server they have people on if you ever need help and it's really nice and nobody mean and it is very positive. My life consists of three things: food, sleep and play.pokeverse.org. Literally the only thing I do is just play this server. I will have fun with my rare candies. This server is great and full of people who are friendly and just an overall great environment! AMAZING SERVER. there is alot to like about the community and the server not much to dislike. An amazing server that really brings out the best of Pixelmon. Really does speak out "Gotta catch em all!". Great staff as well. Lovely server. Brings out the best of pixelmon. This server is everything I expected. The staff are friendly and helpful, the restrictions are reasonable, and the massive amount of unclaimed land is amazingly rewarding to work with. Starting is really user friendly and not a bunch of grind. This server is super enjoyable and fun to play on with friends. I was having some lag problems, but the server offers some tips on how to reduce the lag. Really good server over all. It's a really fun game to play! Outstanding pixelmon server. Will be hard at work grinding and certainly going to donate. My ingame name is Vytryx. Its a really good server and all, but I wish that the gym leaders were on more often. Pretty sick server, there is not much to dislike about it. I like the warps they offer, the staff, etc. Recommended server to play on. so cool i liked very much this server! Great server I have enjoyed it every time i play super friendly staff and great community! I've played on multiple pixelmon servers but this is the best one I've played on the community is nice and it's not hard to get started. overall thumbs up!! Creeper935. I approve of this server. Amazing server, works really great with pokemon! Haven't played long but I can see its good! The staff works fast and is nice. i like the server but it could be better for example fix the issue with having to relog to see the pokemon. Really set up well, and very newbie friendly. Also the staff there is super sweet. <3 I wish you the best. It's a great server, and I'd recommend it to all. Cool game but a lot of controls to configure.. The server is welcoming and newcomer friendly, and also the events and games held make for fun breaks of pace. My name is DuckFries, and I approve of this server. I love pixelmon and this server has everything i want in it. Its honestly really good. It has both the play style of pokemon and minecraft mixed! I like every single part of the server. i like this server for this survival and good events the moderators and admins and i dont know who is very nice to players and helping and ever 15 minutes is a event its great and thanks. It's a really fun server with a lot of really nice people. I love this server. no lag and plenty of fun for everyone. Amazing Server! Waiting for Auction to start up again! DChit I love it and its really fun with pokemon and minecraft at the same time! halvardoh, man i love my dog. 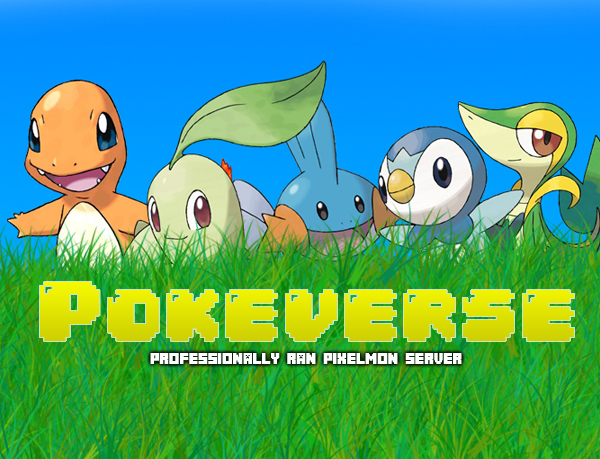 I love the Pokeverse server, it's by far the most active, well-built, yet still sandbox feeling server for Pixelmon. A lot of times you'll find a good Pixelmon server that is far too structured, or completely unstructured, but I like the setup of Pokeverse and I like how helpful and nice the mods and staff are. Is so much fun this server!!!! I've just started playing on the server, and so far it seems grat. It's lagfree so far and seem nice. Great staff that treat you Like family! Server is fast and responsive. The server is great, it has good staff, they answer quickly and the help, its easy enough to find, catch and level pokemons, its a great server. This server is pretty good, I like it. Play it! I like the animation while battling. It because it make more battle more entertaining to watch than just clicking word. Updated regularly, lots of events, no drama. I love the server! Amazing pokemon and staff! It's a chill and friendly community, the only downfall is you have to buy a rank to get more homes or pay 15$ off the bat as you only have 1 home by default. The server is awesome. I love the way you can grind and become a great pokemon trainer. Staff is awesome and community is great too!! Just started. Everyone seems friendly and helpful.Great spawn. This is a cool server to play on. The community is friendly and fun, staff are great and helpful, and the map plus plugins are awesome! Pixelmon is very fun especially with friends. This server, im not sure about. Staff is not very good with welcomes and the blah blah of "read /rules and do /kits to get started"
They dont notice you unless you have a rank. Im not sure if thats on purpose or not. The event they hold are fun though. Im trying to be part of the community but its like they wont let me in. I would like some rare candies, but I think it's a bit overwhelming with the amount of colors in chat. Nice server regardless. I really love it, the servers are even better!. Imagine Pokemon but multiplayer. Its like all of my childhood dreams come true! Great server friendly community runs smooth and has a awesome staff that has helped me out quite a bit! very fun and got a shiny on my first ultra crate!! Good community that is relatively drama free and great staff. good claiming system and helpful staff. I just joined and the server and it is really fun, I like the currency system to. Friendly members and staff, very frequent events. I enjoy the rewards we get from voting and such, but I think that there should be more ways to get money, like perhaps a jobs plugin. Everyone is really friendly and helpfull. Love the plugins they put in it feels like you will never get to feel bored again. Been playing for about 2 weeks now and seems like a pretty awesome server. Haven't once had any issues! definitely recommended. This server is all around very pleasant, the staff is very helpful with any problem, and no lag. 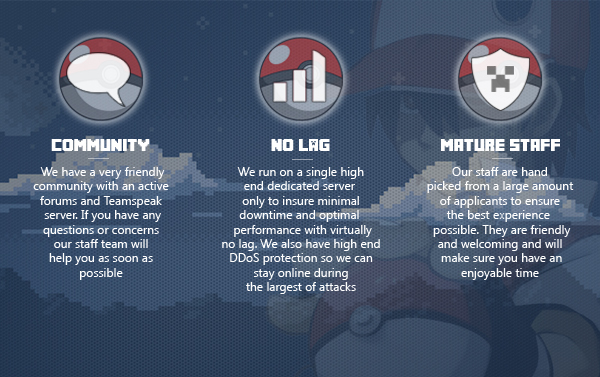 Great pixelmon server little to no toxic people and it has great staff that will always help. Its good, I play on this server some times when im bored, but when i do im satisfied. my ign is thencallmesavage and i love this server. its great and i would always leave a positive review. I liked the server very much, especially for not having errors and Lag and also for having very active players. Great friendly server, a lot of fun! It's very fun, I really like how everything is done, but I wish Spawn Rates where higher. I titanknight707, believe that this server is pretty good and I will most likely return, after being given a shiny magikarp I am encouraged to keep playing it, as it is great. friendly users, easy to learn! Great server with friendly users! Love the server!! Would recommend this server to a friend! Absolutely amazing server. Great community! Love the people overall great server !! I really like it so far, I've only been playing for a few hours but from what I've seen it doesn't lag and everything seems to be organized pretty well. I like the server alot and it is lots of fun. Really fun, great community. Perfect for new players! Everything I have to say about this server is good. Very fun and friendly server with helpful staff. The staff are nice and always answer questions when they can. I assume they do a good job of moderating the server since I never see any rude players. The server is well made and a lot of fun to play with friends in my opinion. One of the best pixelmon servers I've played on in a while. The discord is helpful and staff is great. The community is also very positive and helpful. Good Server With Helpful Staff! this server is good because it has a good staff team, good concepts, nice community and it's playable. It is really fun to play on the server because they host events every now and then, and it's not super laggy like other servers. Its okay not perfect but good. Really good server and really nice people :D .
The Perfect Server For Me. The Community Is Perfect. The server is amazing, but it is a bit laggy for me. The staff are kind of annoying and they do not put up with anything in public chat, the server is very laggy, other than that it is quite average. I really like this server, and I think it has a lot of potential. I'd like to see where the server goes from here. This is the best modded server I've played. I think the server is doing pretty well. The nice thing is that the players on the server help you if you have any problems. sometimes there is a litte lag but not that much. I'm just going to say that ChargeBolt16's first 15 minutes of this server were very pleasant. Love the server so far! Very welcoming to new players with a huge range of activities to keep us busy! Good server. There should be Shiny Starters though. I think this is a really good server, because its the only good server i've been on. Really good. I like the server very much. Really awesome server. I really recommend it. This server is very fun and has a very nice community I totally recommend playing on this server. nicest community I've been in for a long time! Love the environment, highly recommend. Server is really relaxed and easy to get into. Nice community. The staff is friendly and helpful. Everyone is polite and the server is amazing. The staff are really nice, and overall everyone is helpful to me since I am a newcomer! Thank you. This Pixelmon server is one of my favorite servers, I love that the people playing the game are really nice from what I've seen in chat and the mods always welcome someone when they can. I really don't think I can leave a bad review on this server. So far it's neutral at the moment because I'm new but hopefully this can change. Great server, Lots of fun. Really good mods. I love playing with my friends on this fun server. The community is excellent. The staff is very helpful. I love this server. The mini games are great and the crates are interesting and fun to open. I really enjoy this server will will keep playing it in the future. I just started playing today and already love this server. It has fun mini games and cool crates that other servers I played have not. I love the fun mods and people on the server. First time playing in a while. Nice to see there's still a good pixelmon server around. Been looking for a normal not-lagging pixelmon server, and here I found it. So far so good. The Server is really cool and is not laggy! Best Pixelmon Server! It’s an amazing sever great job! beautiful gameplay and i love the server!! Very fun. Super easy and super accurate! I love the game. Very accurate to similar to original games. Super fun and super easy to learn! This server is honestly really fun and I can see myself playing on this server for hours on end. It's really fun and really nice. I've only been on this server for a couple of hours , but honestly has been an amazing experience so far. I play on the server a lot, and it's a great server with friendly and helpful staff. Nonocraft_BR: I like so much this server, i play whit my friends and we have a lot of fun. Congratulations for this server! Server is great! Very active staff, regular server events, friendly people. The server is great! I have played for a while now and its one of my favorite servers. lilpizzaman75, Awesome server really helpful people all around! enjey2304 Best Server In The World! Gerrymitx, This is a very nice server! This server is fun for all players and is Pokemon. Who doesn't like pokemon? It is not too hard but not too easy and makes the grind worth it. I Like everything about the server, its fun and I enjoy playing it! it's great, i love the system and how it's built! This server is a lot of fun to play on! Active Staff! Great comunity, and nice admins !!! Its a really good modpack and has really great features. Runs really smooth, Great community, great server commands. This server is excellent! The community is really nice, and they give you free stuff every day. The servers generally runs decently as well. I loved being able to play pokemon with other people as friends or rivals and be able to go on my journey with others. Really nice community and economy. I love this server and ty very much for making it Shmeeb, Its awesome because you can play with other people and more importantly you can play PIXELMON with other people, so ty for whoever reads this and ty Smeeb. Its actually a lot more than I expected. its a great mix between, grinding, pixelmon related stuff, and communication with the players. I highly recommend this server to anyone who wants to get into Pixelmon. It's a great and fun server. I usually use this late at night in the US and the people who are on at that time are usually nice which is perfect for me because I like to play on the server to have a relaxing night. Username Wolffang59. The server is very interactive and intuitive with the chat and spawn area, allowing for a friendly interface and introduction to new and existing players alike. It offers many events to participate in, improving quality of life on the server with rewards. This server has been a blast. I have put 12 hours in within the past two days. All of my friends have joined with me and also enjoy the server just as much as I do. Friendly staff, amazing community, and very nice server all around. Great server. Basically zero lag. Within first few hours of playing I had caught a legendary pokemon. Would highly recommend the server. I like this server because there are other players you can take to, and there is adventure where ever you go. keep on the great work staff! Quite a swell server to play on. This is a great server! Friendly staff and fun events! The best pixelmon survival server I have found, had a blast playing with friends and love the minigames. It's a dope server with nice mods and fun people to talk to! Pretty good server, i like the the mods in the modpack, dont really like how some boss's spawn in ground in places you cant get them, overall its pretty good. It's a good server but the lag spikes it gets can get annoying. Keep up the good work! This server is good because they don't force you to have a shiny and there are good rewards for voting. Nice server very good staff, and a good tone in the chat. Nice server with helful staffs, and a nice tone n the chat. I enjoy this server a lot. Very fun, and innovative. Friendly staff, and very good for new pixelmon players! Absolutely epic server, loved it, 10/10 would play again. Very friendly towards new players. This server is amazing! Its just perfect. I am liking the server a lot,enjoy it! Great server the people here are great and everything is well designed and in good condition but i would like to the Server to get a little bigger since many players play here i would enjoy if if you could expand the current world nevertheless great Server ! Server is fun, runs well, overall fun. The community is super cool and fun to play with. I definitely reccomend. The server is nice and un and so are the people my username is Enderbro88. This is a pretty nice server. Minus: trivia 24/7 and the shops dont have the best directions. Everything else (playergyms, E4, active and nice community, custom items) i like alot. Very nice server and a great community it is a bit laggy but that must be my computer :D.
I like this because it has a nice player base and the staff is very friendly. my name is blade_rider2000 and my fiance and I have a ton of fun playing on this server. Seems like a nice community! Thoroughly enjoy this server, with its great textures, friendly people and the amount of people who offer to help ya. _0_ZERO_0_ : even though I'm relatively new to the server I have been on many others. This is smooth running with great people and helps make the pixelmon experience an amazing one! cavs4lyfe- I love the way this server works it's great including the people of the server, very family friendly. BigDaddyAllMight- This server, This server is the move! Cant wait to catch them all! ChaoticParadise - This server is straight up heat, best thing since sliced bread, haven't had more fun in my entire life! Cripser : This server brings me back to play pokemon on my Ds. Great throw back with amzing fighting mechanics! NightMonsterMc: The staff is friendly and always helpful. Great mod on an even better server.